Originally published in The Conversation on 27 May, 2:30pm. Earlier this week the Grattan Institute released the report Sundown, sunrise: how Australia can finally get solar power right. It looked at the cost of solar subsides and explored emerging challenges and opportunities for solar power to “find its place in the sun”, and generated widespread reports of its headline figure, that the cost of solar photovoltaic take-up has outweighed the benefits by almost A$10 billion dollars. 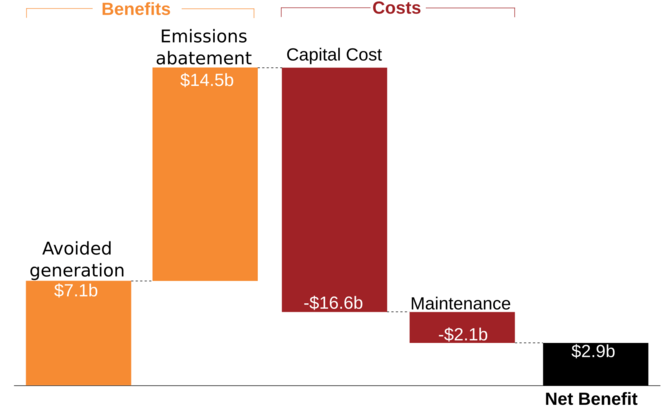 That figure (A$9.7 billion, to be precise) was generated by comparing the benefits of greenhouse emission reductions from solar, against the capital and maintenance costs. The first part of this calculation is therefore dependent on the assumed carbon price of A$30 a tonne, which gives a total benefit to society of A$2 billion by 2030. But why A$30 per tonne? And what is the actual cost of carbon emissions? One metric commonly used is the “social cost of carbon”. This is an estimate of the economic damages from the emission of one extra unit of carbon dioxide (or equivalent). There is a huge range and debate about what the social cost of carbon really is. Earlier this year, a paper in Nature Climate Change estimated the social cost of carbon to be US$220 per tonne. This significantly changes the cost benefit analysis. Last year, Nicholas Stern and Simon Dietz updated their internationally renowned model, finding that a carbon price between US$32 and US$103 was required today to avoid more than 2C of warming, (rising to between US$82-260 in 2035). Other work suggests that should global greenhouse mitigation continue to be delayed, a carbon price of US$40 per tonne of CO2-equivalent would reduce the probability of limiting global warming to 2C by only 10–35%. The Grattan report argued that “subsidies are expensive and inefficient”, but arbitrarily used a A$30 per tonne cost, significantly underestimating the most important subsidy: the fact that polluters are allowed to emit carbon dioxide for free. While the choice of carbon price and costs significantly changes the calculus, looking only at the emissions and avoided generation really misses the point of the support mechanisms in the first place. Why do we have renewable energy support mechanisms? The Grattan report concludes that “Australia could have reduced its emissions for much less money”. This is undeniably true. As the report points out, the federal government’s Emissions Reduction Fund has purchased emissions abatement at an average price of A$13.95 per tonne, and the Warburton review estimated the cost of the large-scale Renewable Energy Target to be A$32 per tonne up until 2030.
ensure that renewable energy sources are sustainable. It is not particularly fair to assess a support mechanism against objectives it was not designed to achieve. Only assessing the efficacy of the renewable energy target against emissions abatement efficiency misses an important component of renewable energy support policy: industry development. Market mechanisms, such as carbon pricing, are widely acknowledged to be the most efficient method to reduce emissions. However, they are not sufficient by themselves and do not address other market failures. …in order to develop, demonstrate and deploy the technologies that are likely to be lowest cost in the longer time frame of meeting the climate change targets, further government action is essential. As indicated, deployment policies are an essential policy to tool to develop the renewable energy industry, and ensure the lowest cost in the long term. Typically, in the context of renewable energy deployment policies sit between R&D on one hand, and pure market mechanism (such as carbon pricing) for mature technologies on the other. Such deployment policies are essential to enable learning-by-doing and realising economies of scale. The cost reductions enabled by this simply cannot be developed in the lab, or be captured in the market by individual companies (due to knowledge and technology spillovers and other similar positive externalities). The report concludes that solar schemes have reduced emissions at a cost of A$175 per tonne to 2030. 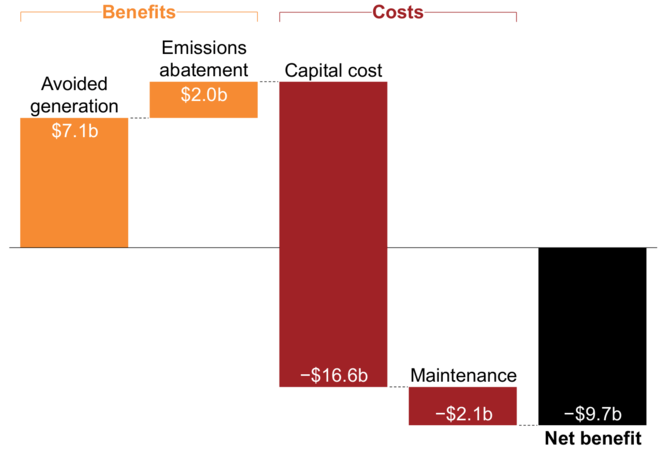 This figure has been derived by using the net present costs and for the emissions abated to 2030, which includes the capital cost of older and significantly more expensive systems. If carbon costs were price at A$220 per tonne, the cost of abatement becomes negative, that is, a saving. An alternative measure looks at the subsidy paid today. Households are currently purchasing solar systems subsidised by the RET at rate of approximately A$0.80 per watt installed, while receiving cost-reflective (unsubsidised) feed-in tariffs. Over an expected 25 year life, and an average grid carbon intensity of 0.85 tonnes per megawatt hour, the cost of abatement would be approximately A$28 per tonne. Comparing this with the cost of abatement only a few years ago (in the order of several hundred dollars per tonne), the support mechanisms look very successful in delivering on objectives of industry development, and delivering cost reductions. Most would agree that some renewable policies have previously been poorly implemented, and the Grattan report is right in highlighting these. However measuring their costs against objectives they were not intended to achieve is unfair. The simple cost benefit analysis fails to incorporate all benefits of renewable energy support policy, and underestimates the avoided costs of carbon emissions.